When the kneecap (or patella) is in its normal position, it glides smoothly in a deep groove (or trochlea) at the bottom of the thigh bone. A normal groove is lined with healthy cartilage, and it is supposed to cause no discomfort. When the kneecap pops in and out of its normal position, the cartilage of the groove and the cartilage under the kneecap rub against each other. Over time, this rubbing causes the cartilage to slowly wear away and arthritis sets in. After a while, the cartilage virtually disappears and we end up with “bone on bone” which is very painful. I’ve seen this condition in three different stages of progression. It most often appears in small dog breeds born with it. I can tell you that treating it early is always better for the patient. Just look at these three scenarios and you’ll see why. 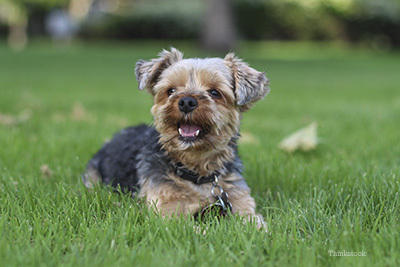 Link, a 7 month old Yorkie, seemed healthy in every way. Yet, every once in a while — for no obvious reason — he held his left, back leg up. He ran around on three legs for a while, and then suddenly seemed to be back to normal, using all four legs. Link’s owner took him to a family veterinarian where a physical exam revealed that his left kneecap slipped in and out of the groove. This scenario was classic for a kneecap dislocation or patella luxation. Now was the ideal time to perform surgery — before arthritis set in. Fortunately for Link, his owner decided to go ahead with the surgery. After two months of strict confinement and physical therapy, Link was essentially back to normal. He would receive two joint supplements — glucosamine and fish oil, to help slow down arthritis. Again, this is a very common scenario in small dogs, but can occur in larger dogs. Early intervention, before damage to the cartilage occurs, is the secret for a long, comfortable, active life. Sadly, it doesn’t always happen that way. Gannon, a 7 year old Pomeranian, went to the clinic with a long history of right, hind leg lameness. For over 6 years, he had been holding his right, back leg up and it seemed to be getting more and more painful. The situation was essentially the same as Link’s. The big difference with Gannon was that years of rubbing had led to severe cartilage damage. He had reached the “bone on bone” stage, accompanied by significant pain in the knee. Surgery could still correct the condition, but we could not replace cartilage; so while Gannon’s condition could be helped greatly with surgery, he would realistically never be as sound as Link. Even though it is rarely discussed, I have noticed a third scenario that typically occurs in small, older dogs. These dogs may have somehow found a way to cope with (and hide) an ongoing kneecap dislocation. Alternatively, their owners may have decided not to do anything about the limp or surgery may have never been recommended. Later in life, around 10, 12 or 14 years of age, the instability of a knee affected by a kneecap dislocation led to a tear of the anterior cruciate ligament in the knee (ACL). Dogs don’t function well without an ACL, so this is when these patients might finally be referred to a surgeon. Here again, we can stabilize the knee. Fixing the kneecap and the ACL are very common procedures. What we can’t fix is arthritis. While surgery will still be of great benefit for this dog, he won’t enjoy the same relief as Link. If you ever notice a limp in your dog, visit your family veterinarian right away. Whether your dog fits scenario 1, 2 or 3 vets can keep the problem from getting any worse. Once a diagnosis has been established, your veterinarian can offer solutions to improve your dog’s quality of life.